All sold thanks for looking! So I took a blog-break, and I think I'm back. And with that comes new ideas and hopes for this little blog that started out as nothing more than a place for me to report on how poorly I did on last week's cyclocross race. Hopefully, the site is a little more than it was then. The readership is still pretty high (despite my non-presence) so that is inspiring to see. A few things to mention, you will see to the right of the screen something that looks like Ebay links. Thats because they are Ebay links. There's no tricks here. There's no pop-ups, no spam, no crap. It is a service that allows me to choose an Ebay search criteria, in this case "cyclocross" and then a few cyclocross related Ebay auctions pop up in the sidebar of +1lap. Its totally legit. The catch? Well, the catch is that if you click on the Ebay link and end up winning the auction, then +1lap makes a few cents. Anything to pay the domain hosting bill and domain forwarding bill is cool with me. Also, I still have quite a few +1lap tshirts available, from 2006. I am looking at creating a new shirt for '07, and the '06 shirts wont be printed again, I got about 20 left or so. So get them if you want them, before they're gone. If you have any new and cool ideas for a cyclocross shirt, let me know and we can make it happen. Lastly, I'd like the +1lap galleries to grow to be a resource for cyclocross fanatics to look at what some people have done in building up cool rigs. So send me photos and a parts list of your cross bike if it is under 18 pounds or handmade (or both)! New galleries may be appearing here shortly as well. 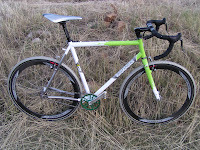 The second Indepedent Fabrications bike to hit the +1lap customs gallery is Ken's titanium lightweight rig. Independent Fabrication Single Speed 'Cross bike, 16.45lbs. A friend is selling his Pinarello cross bike in size 60cm on ebay. Check it out.